It's been ten years in the making and it has taken 18 films to reach the pinnacle of what will be the biggest game-changer in the Marvel Cinematic Universe. After only showing up briefly throughout the films (Avengers, Guardians of the Galaxy, & Avengers: Age of Ultron), Thanos has taken center stage with the Black Order as they reign chaos in Avengers: Infinity War. I will be giving a brief non-spoiler review, and then diving in to go over some of the best (and very spoiler-filled) moments. In a nutshell, this film relied on the majority of the MCU films to help fuel what the Infinity Stones are and having brief hints of Thanos. The build-up has paid off in the grandest of fashions. For a run-time of 2 hours and 40 minutes, they filled every bit with enough action, suspense, drama, and overall good storytelling. For the length of the film and the massive cast attached to it, I was very worried that this film would have felt very boring and nothing but a massive "give everyone a moment" marathon but, I was very much mistaken. Everyone had great moments, including Thanos and the Black Order, and the pacing felt very natural. In this case, natural means chaos and stress-inducing moments. This film really takes you for a thrill ride from beginning to end and left me already excited for whatever comes next (which I have theories for, but will be another post). 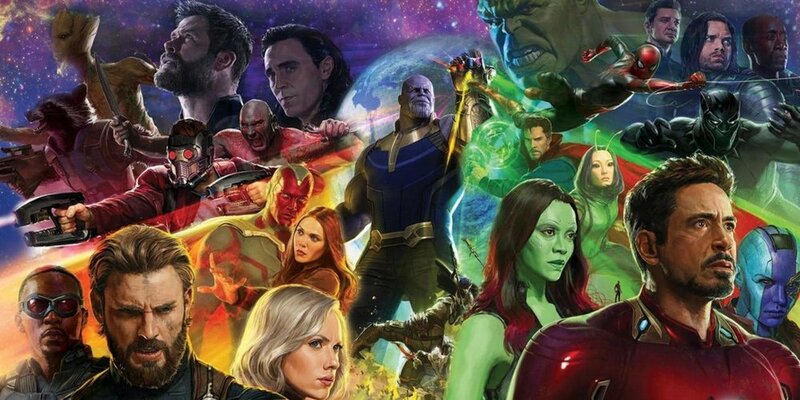 They furthered the plot of what the next Avengers film may be about, as well actually giving depth and actually causing long-term changes in the MCU. I thoroughly enjoyed the Black Order and their role in this film. For the most part, they are pretty much the generals of Thanos and it was a good way to break up the action so that the fights were not solely focused on the Mad Titan. Seeing Cull Obsidian (Black Dwarf in the comics) as more the muscle of the group, Proxima Midnight & Corvus Glaive as lieutenants of Thanos' army of Outriders, and Ebony Maw as the brains of the group. Personally, I love Ebony the most mainly for his power set and his interactions when trying to force Doctor Strange into giving up the Time Stone. Even though we saw a lot of the Black Order, we do get to see Thanos fight right when the film starts on the escaped ship from Thor: Ragnarok. The movie starts with him already killing off the majority of the survivors and then beating The Hulk up so badly, he reverts back to Bruce Banner. But not only that, Thanos has some really great character developments in this film. His whole story was changed on why he wants all the Infinity Stones, but I believe it's a much better reason. In the comics, all he wants is to kill everyone as a way to impress Death (sometimes referred to in the comics as Lady Death or Mistress Death), but always finds a way to either make himself fail or just grows tired of trying. This version has a less sinister development, wanting the Infinity Stones to wipe out half the populations on planets throughout the universe in order to help them thrive and continue to grow. He believes he can be the savior of us all. Throughout this process, we learn a great deal about him, and what he is willing to do to achieve his goals, including killing. The best villains are those who see their actions as heroic, they're the heroes of their own stories. But we'll get back to that in a minute. One of the biggest mysteries in this film was the location of the Soul Stone. Everyone, including myself had theories where it might be hiding. The main ideal locations were in the birthing pod back on the Sovereign planet with Adam Warlock, somewhere hiding in Wakanda, or inside of Heimdall. Turns out, we were all wrong. Not only did they give us a location, but they actually showed us Thanos retrieving the stone that was being guarded by a returning Red Skull (yeah, of all people, Red Skull was in this film). And by the end of the film, you see Thanos obtain every single stone except the Power Stone, which he already obtained by destroying Xandar before the film started. Which made the final act of the film about him retrieving the Mind Stone out of Vision. The fighting in this film was thought out very well, giving the majority of the team-ups a good amount of time adapting to each other as well as fighting Thanos in the multiple locations. On Knowhere against the Guardians, on Titan against Iron Man, Spider-Man, Doctor Strange, Nebula, and some of the Guardians, and on Wakanda against Steve and pretty much demolishing everyone else. The majority of the crew felt important to the struggle and found myself rooting for them the whole time. But that rooting fell upon deaf ears. Which leads me to probably the somewhat shocker of this film, the death toll. The Russo Brothers went on record and said that some characters would be dying in this film. And they said that some of them will stay dead. It's comics, so we already know that some will come back, but the manner that they went was so dark and such a high-risk maneuver for this film. In the first 20 minutes of the film, Thanos immediately kills Loki (yeah, he is really dead) and Heimdall. Then, in order the receive the Soul Stone, he sacrifices Gamora because she was the one thing he loved above all else. Then, destroying Vision to obtain the Mind Stone. And finishing it all off with snapping his fingers, with the complete gauntlet in hand, to wipe out everyone else except the following characters; Captain America, Thor, Iron Man, Rocket, War Machine, Nebula, Black Widow, Hulk, Okoye, and M'Baku. This list should include Ant-Man and Hawkeye because they were not in the film at all. The most heartbreaking and tear-jerking moment for me was seeing Peter Parker slowing fading away while begging in Tony's arms to not go, repeatedly saying "I don't want to go." That's how the film ends! More than half the Avengers gone, Thanos escapes and is back on Titan enjoying what he has accomplished, and me thoroughly re-thinking my theories of where this is going. We did get a taste of what's to come through the one end credit scene, Nick Fury, and Maria Hill watching civilians turning into ash. As Hill and Fury slowly fade into nothingness thanks to Thanos, we see Fury make one final call out/page. Who does he call? All we see is a space like-pager with the Captain Marvel symbol brightly shining. Overall, I need to see this film again, but after a first viewing, I believe they made an excellent film. There's so much more I haven't even covered, but I really wanted to get some of the big stuff in this review. I don't know about you but I am ready to see where we go from here.